It’s bridal shower season here. 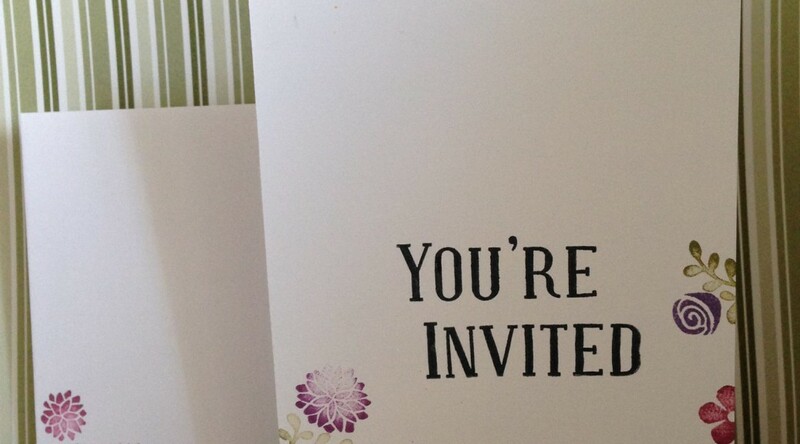 My mother in law is attending a bridal shower in a few weeks and needed a card. Bridal showers always remind me of kitchen gadgets, so I made two cards based on that idea. I find it’s always good to have an extra card just in case. The layouts for both cards are the same. I saved the circles I cut from each panel to use on the opposite card. 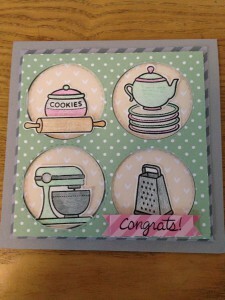 Extra Details: The images are all fussy cut out and adhered flat to the small die cut circles. The top layer is popped up on DIY foam tape. 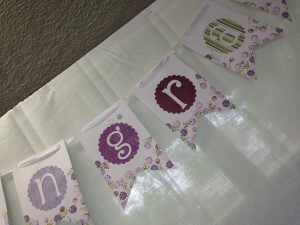 This banner is for the bridal shower that started the whole crazy stamping thing. 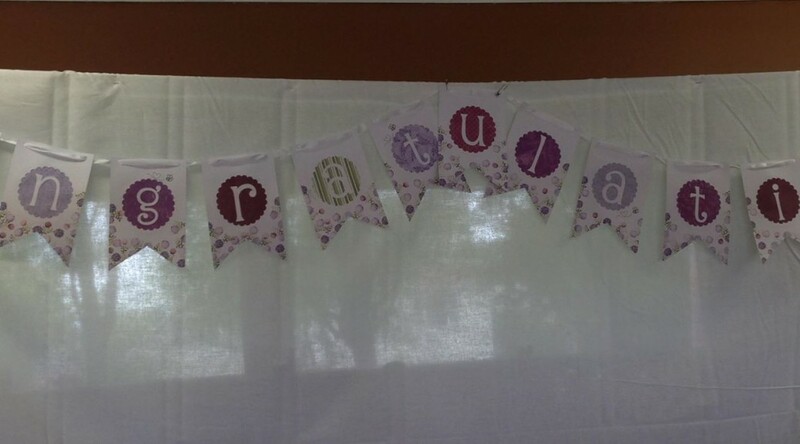 After I made all the invitations and thank you cards, I knew I wanted the decorations to match as well. I started with this banner. Extra Details: I started by cutting the scalloped circles from some patterned paper on my Cricut machine. I also cut the white letters with my Cricut machine. I created each panel for the banner out of white card stock. I adhered the scalloped circles and letters to the panels. 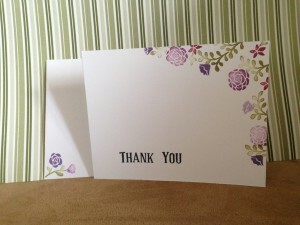 I stamped the floral images on each panel. I tried to make them look random and organic without making myself crazy. I also added a few bees for interest. After all the ink was dry, I hole punched the top corners and used white ribbon to attach them all together. 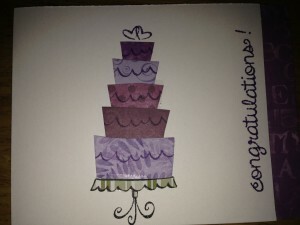 This is the card I made to go with my gift for the bridal shower that I helped with. I wanted a card that matched the shower. 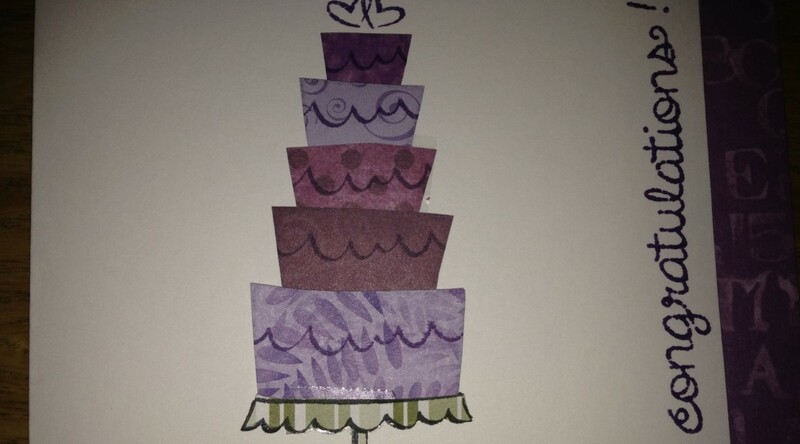 Extra Details: I paper pieced the cake using the same patterned paper I used to decorate the bridal shower with. I also cut the front of the card base a bit shorter and glued some patterned paper to the inside so it would show through. 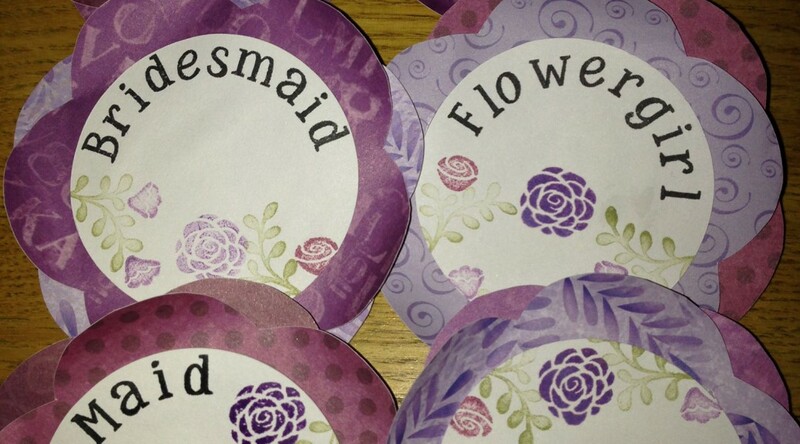 These nametags are for the bridal shower that started the whole crazy stamping thing. After I made all the invitations and thank you cards, I knew I wanted the decorations to match as well. I also made nametags for the important people who would be at the shower. 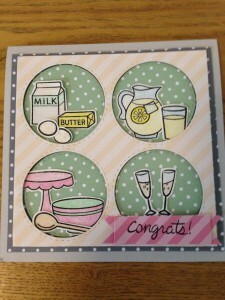 Extra Details: I started by cutting the scalloped circles from some patterned paper. I free handed a flower design for these. I cut the white circles on my Cricut machine. I added the lettering first in black ink. I filled in the empty spaces with florals that matched all of the other decorations. I adhered the white circles to pieces of patterned paper. I used a large safety pin on some duct tape so that people could wear them at the shower. This is the card that started all my card making craziness. 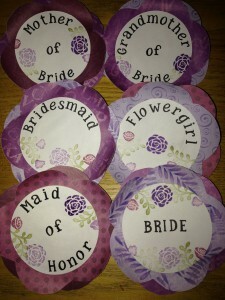 I was asked to be the Maid of Honor in my friend, Kathy’s wedding. Part of being Maid of Honor is helping to throw the bridal shower. 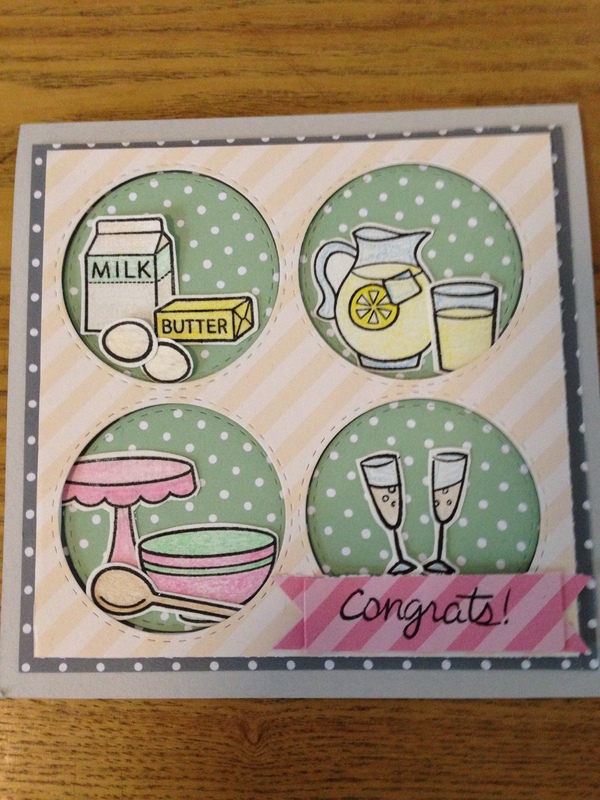 I was looking around for ideas and happened on some card making and stamping videos on YouTube and was hooked. I ordered a few stamp sets and inks and have been hooked every since. The back of the card. The groom is a bee keeper and I wanted to include a bee in the design. 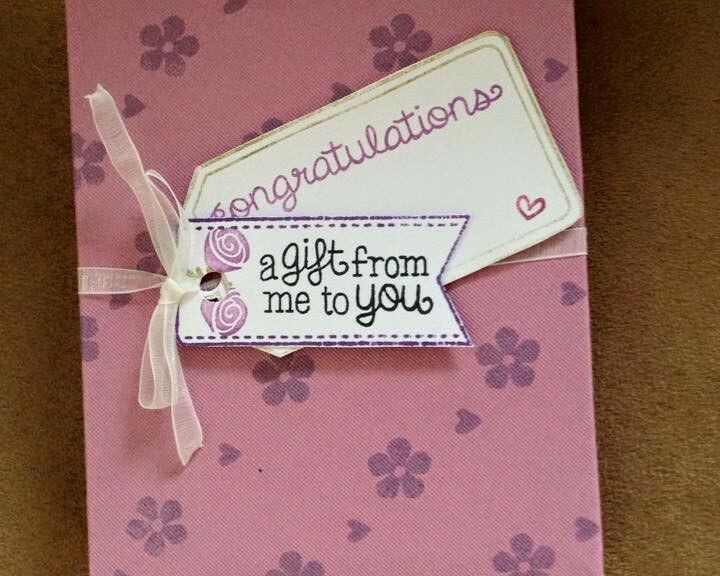 Extra Details: I started by creating the inside of the card. I typed all of the information on Word and printed it on white cardstock. I then cut the sheets into card bases. Then the fun of stamping began. I started by stamping the sentiment in the center first. I added the florals to the bottom edge. 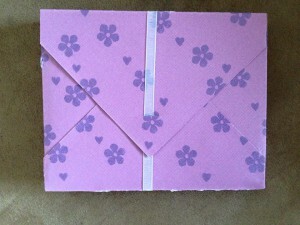 I also put a few floral on the inside of the card, but did not get a picture. I stamped and colored the bee image and was done. 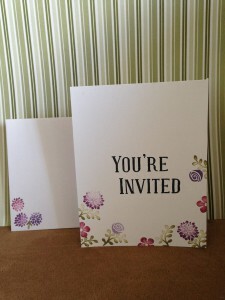 After I made all the invitations for Kathy’s bridal shower, I started to think about the gift I wanted to give her. 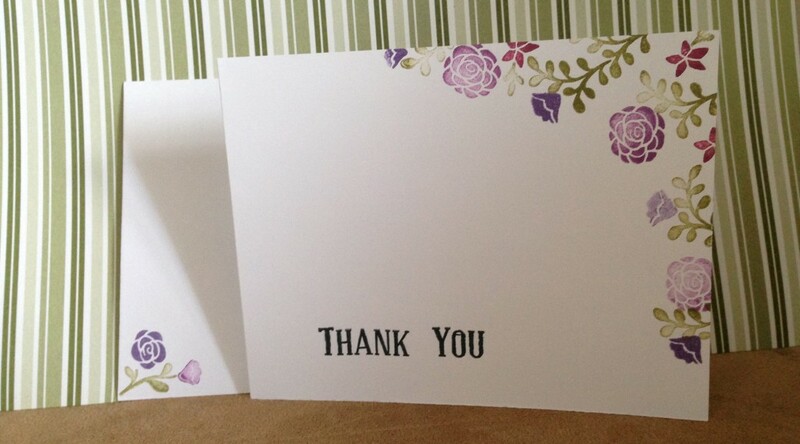 After thinking for some time, I thought about thank you cards. 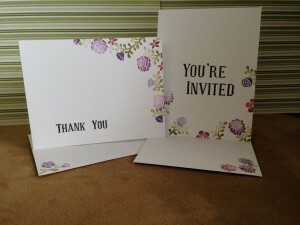 A set of matching thank you cards would be the perfect finish to her bridal shower. 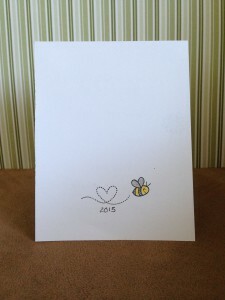 This is the back of the invitation but I added the same bee to the back of the thank you cards also. Extra Details: I started by creating my card bases. Next came stamping the sentiment in the lower left corner. Then, I added the florals to the upper right corner. These cards were very simple to create. After creating all the thank you cards for Kathy’s bridal shower, I needed to find a way to package them. 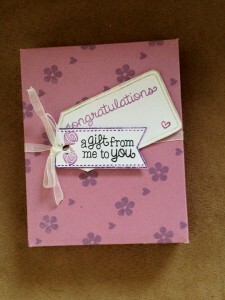 I made this simple box and added a few tags as embellishments. Extra Details: My daughter helped me stamp all the flower images on the box. I found tutorial on line that showed me how to make a box using my Martha Stewart Mini Score Board. After the box was put together, I made the tags for the front. I fussy cut them out and used a white ribbon to tie everything together.